Since his tender debut at the age of 17 at the Glasgow International Street Festival in 1989, Donald has worked for a huge variety of companies and shows …. A staggering nine hundred shows for the world-renowned Pomp, Duck and Circumstance dinner spectacle in Germany! He has also appeared in such illustrious productions as the Wintergarten Variete in Berlin, La Clique, Gourmet Circus in Klosters and many more. Donald has performed with several circuses over the years, including the world-famous Cirque du Soleil, and Circus Monti in Switzerland. He was awarded a silver medal and two special prizes at La Piste aux Espoirs international festival in Belgium, and was a gala finalist at the Festival International du Cirque de Lausanne. 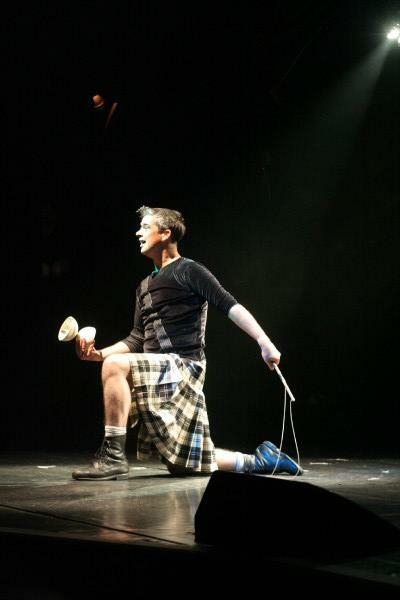 More recently, he won the Bronze Star at the International Circus Festival at Edinburgh Fringe and appeared twice in the “Best of the Fest” Spiegeltent. From the elegant charms of the Holders Festival in Barbados to the vibrant mayhem of Glastonbury, Donald has also appeared at his fair share of festivals. St Magnus Festival in Orkney, Henley Festival, London International Mime Festival …. And as a guest for various shows at Edinburgh Festival of course! Far too many to list, but over the years Donald has appeared at events for many diverse companies such as Ernst and Young, Sony Ericsson, Pringle Fashion, Homecoming Scotland, Fairmount Hotels, ABN Amro, Scottish Widows, Pricewaterhouse Cooper, Mercedes, Sheraton Hotel group and more. When he’s not busy entertaining the general public, Donald often finds time to appear at juggling festivals and conventions. He has twice been an invited guest at the International Jugglers Association festival, in Las Vegas in 1995 and Montreal in 2000. He has also performed and taught at the European, British, Dutch and New Zealand conventions. He also recently had the honour of appearingin the special “Legends of Juggling” show at the EJC, the World’s largest circus festival. As well as teaching at conventions, Donald has also taught as a guest instructor at The Circus Space (UK), Ecole Nationale de Cirque (Montreal), Circomedia (UK), Codarts School (NL), Theatre Cirqule (CH), Jonglier Katakomben (D), Belfast Community Circus and Turku Performing Arts school in Finland.